Home / Brooklyn GOP Radio / Children / Gene Berardelli / Liberal / LIberal Bias / Melissa Harris-Perry / MSNBC / People's Republic of New York / Star Trek / We Are Borg MSNBC. And you thought that collectives wouldn't reach Earth until April of 2063! Of course, this original graphic parody is referencing the parody of reality that MSNBC is quickly becoming. 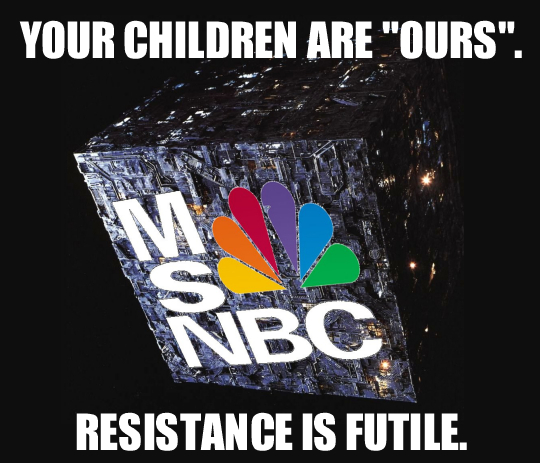 Fifty years before First Contact, the conservative blogosphere have been all abuzz over the MSNBC promo where Melissa Harris-Perry explains how your children will be assimilated and how their individuality will be added to the Collective. 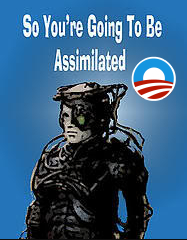 Actually, when you think about it, the comparison between Borg and the Liberal Left World View isn't that far off. Let's take a look, shall we? your "enrollment" into our "collective". They believe in a strong centralized system of rule where the, ahem... to coin another Star Trek phrase, that the needs of the many outweigh the needs of the few. "You" are replaced by "we". "Your" needs are secondary to the group's needs. Soon enough, "You" go through a process by which you lose yourself - your individuality, your dreams, your desire, your ambitions. Those things don't matter so much. After all, "You" now exist to perpetuate the continued existence of the collective. The rest just gets in the way. That is, so long as there is someone from whom you can take everything. Those others are defective. They are imperfect. They do not see past their selfishness. They do not see the perfection in being like "You"... I mean, "Us". The goal must be to convert them over. "They" must be like "Us". So how do you attempt to accomplish this goal of perfect uniformity under a central unity? "You" change to suit the situation. "You" evolve. "You" adapt. Oh, and you sometimes have a weird way of communicating. It's not exactly words. It's sometimes can't be explained from the outside looking in. It's not always verbal, but somehow everyone gets it, so it must be right, right? Get the picture yet? Whether in real life or in science fiction, giving yourself up to "The Collective" is never a good thing. You are the only You there is! If You work hard, You can go far. Maybe You can push the bounds of your field because You see things a different way than the group. You should be allowed to compete to be better than the best, and as a result, do good work and get good things in return. You help others who may not be as good as You because You want them to try to be as good as You and to enjoy what You enjoy. Is there a place for group-think? Of course! Groups of "Yous" coming together is a beautiful when each brings their own ideas and energy to the Group. The difference is that the Group isn't what's important and uniformity isn't the goal. The Group is there to help You, and in turn, You help the Group. The point is: Don't stop being You - no matter what any group "believes". A political blog with not to much to torch on in the way of good news for within the Republican Party here in Brooklyn the battle is raging and all we can do is to stay calm and try to make a little humor and pray the war will end soon and in the mean time A Poem For My Friends In Thought! What is a creation but a thought! It was only yesterday we created the integrated circuit, photography, radio, telephone, television to name but a few. Today I will write of the integrated circuit or the chip for short, for it will continue to evolve be endless in what we make it create. Tomorrows to come there would be no need for schools because these chips will be inserted into the newborn fetuses and these brains the knowledge of all our learning will be within the brain’s thought, any new knowledge will be updated daily! The need for amusement, drink, food, leisure, shopping,sports and work will be but a sequence of thoughts all of these many desires and needs will be filled seconds of thought by these chips. Death will cease to exist for we will find a way to preserve the brain with these chips and with the evolution of these chips birth of a new religion will be created and it will be called Chipism. Their beliefs to honor and serve mankind their creators and on the many altars will be the brains of mankind who sit dreaming, relaxing and leaving the creation to the chips.